COLOR(S): Red speckled or mottled, blue speckled or mottled; markings of black and tan, tan, or red. This breed is one of the newer breeds found in the world, it is also known as a Australian Cattle dog the blue heeler or the red heeler. This particular breed of dog is not only known for its physical athletic appearance, but also for its hard working skills, unmatched stamina and guarding expertise. This breed is very tough, eager and is loved by its owners for its herding abilities, its braveness and awareness. The Queensland heeler is as very bold and aggressive dog and is not recommended for the inexperienced dog owners. They are protective, loyal and independent. They are not good with small children and that’s why they are not recommended for homes, they are not good with small pets and other animals and need a dominant owner. This breed has a double coat, the outer and the inner, the outer one is flat hard and straight, where as the inner one is dense short and soft, this breed sheds heavily once or twice a year, because of its aggressive nature, it needs an early socialization and obedience training. They are good learners and require a good trainer, the training must be given with patience and fairness, they will not respond to hard and tough methods of training, they require constant exercise to remain fit. This breed is not recommended for apartments, it does better in fields or rural settings, if they have any job to do they require regular exercise. They need regular brushing to avoid dirt and dead hair, their bathing should be done when its required and their ear and nails should be checked weekly. 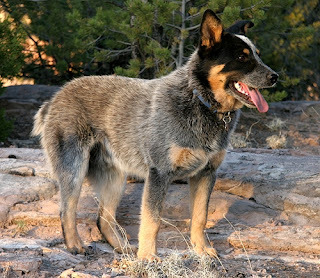 The Queensland Heeler is prone to such health problems as deafness, PRA, and hip dysplasia.